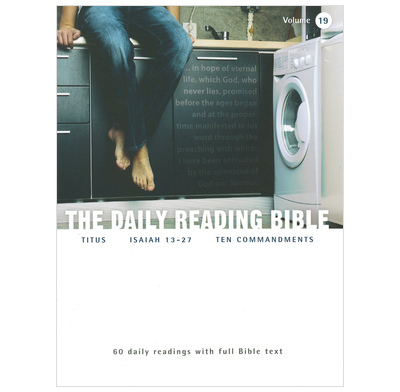 60 short daily Bible readings on Titus, Isaiah 13-27 and the Ten Commandments. It's a neat idea and useful if you don't have a Bible to hand. My wife and I use it at the end of the day, and the questions don't really work for the two of us together. I would have liked more provocative comments/questions. The print for the footnotes is too small! Yes, I know you don't have much room, but it is a strain to read. It was not your fault that the first set of readings was on Judges, which we have studied recently in our home groups. The suggested extracts to be read were helpful - it's ok reading an extended passage silently but I read these out loud, and a long passage is hard going. The passage length in Romans is more appropriate, but I think the questions could have been better. Perhaps these notes are not intended for old folk like us. I'm signed up for the year and will persist. Well presented and challenging, through provoking and educational. I like the approach that you take in terms of taking a logical approach in studying the Bible one book at a time and completing a study of the entire Bible over a given period of five years. I have just started using these notes(No 20) and have found them very helpful and thought provoking. To have everything together is time saving but there is nothing like using the Bible to see context etc. If Bible passages were taken out this would be a small book. This is not necessarily bad as the questions and things to ponder are stimulating. I've tried other Bible notes and these are by far the best. What concerns me is that volume 20 is the end of the line. Are there going to be anymore published? Sadly not Tim. Matthias Media have no plans to add to these 20 volumes. Your best bet is to switch to Explore or to start again from Volume One!! A great way to fit your daily time with the Lord into your day. Handbag size and light weight - no need for a Bible; means you can find time to study no matter how hectic life is.